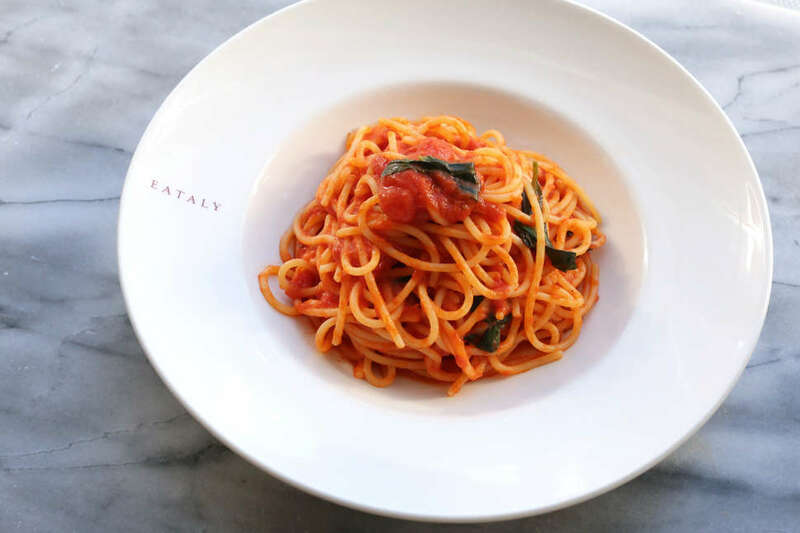 After years of anticipation, Eataly -- the mega-popular Italian marketplace with US locations in NYC, Boston, Chicago, and soon-to-open Las Vegas -- has finally opened its doors in LA. The chain’s foray to the West Coast comes with an even more dedicated localvore mentality that’ll have California meat, fish, cheese, and produce prominently featured in food stalls and on shelves. 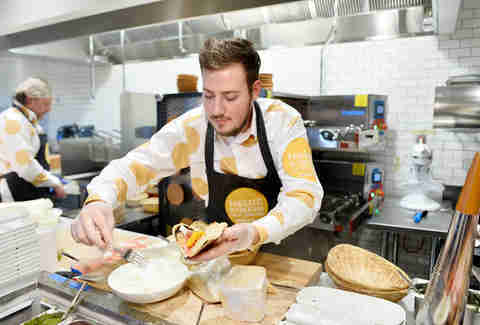 To call Eataly a grocery store would be like calling Noah’s Ark a cool boat; on top of every ingredient and wine label imaginable, the tri-level multiplex has dozens of dining options between restaurants, cafes, and quick service counters. 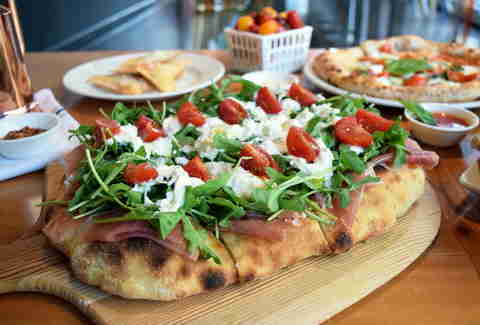 To keep you from being lost in a labyrinth of Italian delicacies, here’s a starter pack of menu items to seek out on your trek to Century City's Westfield mall. Just to give you a taste of how deadly serious Eataly takes its authenticity: the gilded, wood-burning pizza ovens here are shipped in from Naples and feature a cooking surface made from volcanic stone sourced near Mount Vesuvius. No Pompeians will be injured in the making of these pies, though -- not with the likes of world champion pizzaiolo Davide Civitiello manning the Rossopomodoro pizzeria. You won’t need to load up on anything beyond the margherita pizza, made with dough that’s spent 36 hours rising before being placed into the 800-degree oven for all of 90 seconds to attain its ideal, marshmallowy texture. Be sure not to fill up on pizza, because you’re going to want to save room... for more pizza. 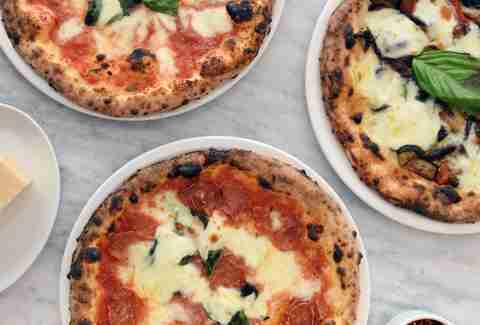 As good as the thin-crust pies are, Eataly is equally lauded for its pizza alla pala: flatbreads made with a dense, naturally-rising dough that make for an airy, chewy center. The thick crust is a vehicle for topping combos like Brussels sprouts and pancetta, heirloom tomato and vegan walnut pesto, or spicy soppressata salami and fontina. A single square makes for a formidably cheap and quick lunch. 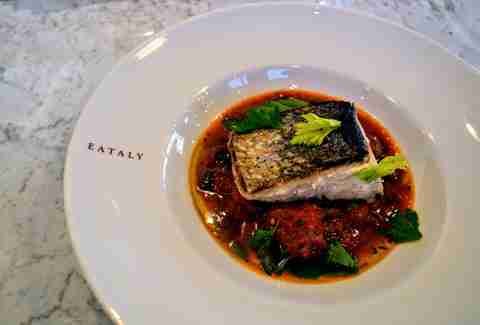 One of Eataly’s strengths in assembling a team is not shying away from aligning with local chefs and purveyors. That’s how you wind up with chef Michael Cimarusti and the restaurant team from habitual Eat Seeker mainstay Providence sourcing and preparing the remarkable seafood selection at Il Pesce Cucina. You’re in good hands for a lineup of uni crudo, grilled scallops with hot salt espelette, and sea bass -- whether you prefer the flakier white or tender black variety. There aren’t too many taco variants that haven’t been taste-tested all throughout Southern California, but panigacci -- the calling card of Tuscan bakery Panigacci di Podenza -- are likely to be the newest addition to your taco bucket list. Filling the role of the tortilla is a simple, unleavened bread fired between layers of stacked terra-cotta plates. From there, the firm and glutenous panigacci assumes its taco form with fillings like prosciutto, formaggi, and veggies coated in EVOO. It’s very easy to leave Eataly having unintentionally received a crash course in pasta by watching scratch noodles continually run through the Imperia pasta maker, and glancing at the poster of Italy’s anatomy of regional pasta styles. You’re liable to run across peculiar pasta types that -- unlike gimmicky mac & cheese fun shapes -- do serve a function. 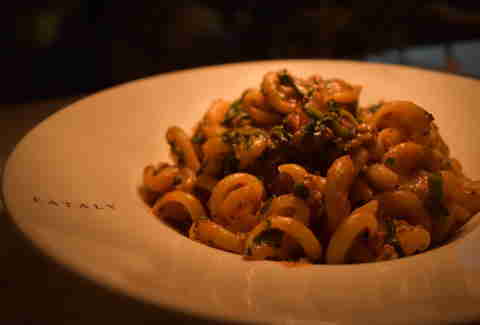 Take, for example, La Pasta’s Vesuvio al sugo di Agnello: the short, swirly Vesuvio noodles are capped, making it effortless to sop up tomato sauce and capture bits of broccoli rabe and lamb sausage in each bite. Cheese makes its way into nearly every menu item available at Eataly, and rightfully so. 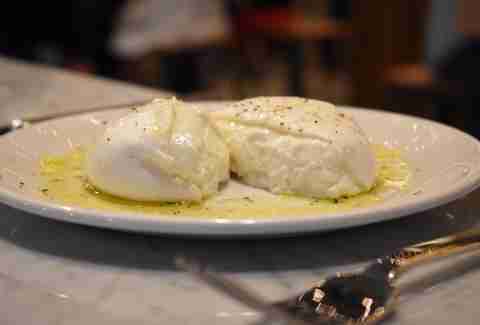 The local cheese supply comes from Di Stefano Cheese in Pomona, whose owner Mimmo Bruno lays claim to having introduced North America to the wonder of mozzarella filled with creamy stracciatella. The family-owned dairy company will have its cheesemakers onsite each day making fresh mozz using traditional methods and the best local curds, a sampling of which is only going to be a gateway cheese to ordering a plate of well-oiled burrata. Rotisserie might not be at the forefront of your mind for your Italian food crawl, but it should be. Do not overlook the La Rosticceria counter and its offering of succulent black angus beef from Creekstone Farms, slow-roasted with olive oil and a porcini mushroom rub. 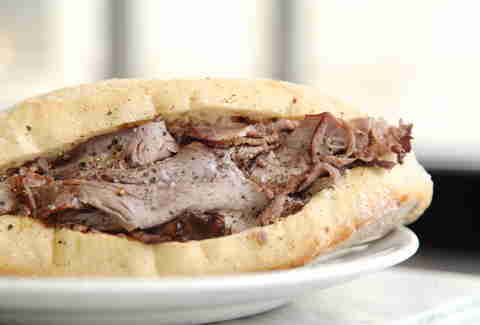 Have it served on a house-made baguette, or as an entree with sides of caponata and mixed olives. Outside of the cooking school and Lavazza cafe, nearly the entire first floor of Eataly is dedicated to sweets. The gelateria has 30 flavors of gelato and sorbets that can be consumed via cannoli cone, or even better, piped into a freshly fried bomboloni. 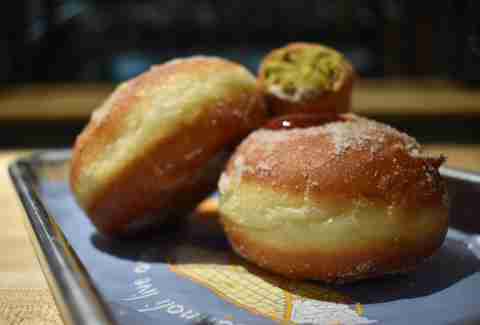 These sugar-coated donuts are filled-to-order with options like pastry cream, ricotta, or jam -- but, c’mon you’re going to fill that donut with ice cream, right? Sean Cooley is an LA-based writer who covers food, travel, and events. Eataly openings are his Woodstock. Follow his spirit quest on Instagram @SeanCoolish.